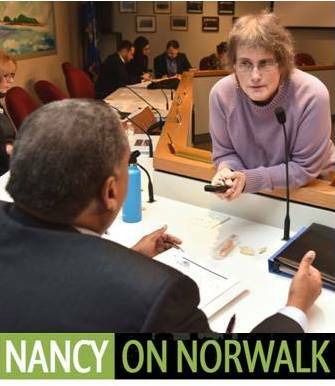 You read NancyOnNorwalk for stories and details that you won’t find elsewhere. Stories about PACs, POKO, and protests. Stories about your schools, your government, and your tax dollars. Your tireless reporter Nancy Chapman goes to public meetings, stays late, and then writes until 5 a.m. She sifts through thousands of pages of documents. She asks questions. She brings you unmatched stories about your hometown. Videos too. You read NoN because you value the role of a free press in holding your government accountable. But a free press costs money, and it’s only possible if the people who read the site support it financially. Keep Nancy asking questions on your behalf. Donate today! Now it’s time to support Nancy’s work with a donation that says how much you value local journalism. NoN has joined with 154 other independent news organizations around the country to participate in a two-month campaign called NewsMatch, supported by the Institute for Non-profit News (INN). NewsMatch will double every dollar you donate, up to $1,000 per individual donor. All new subscriptions are doubled, too — if you subscribe at $10 per month, NoN receives a match of $120. Our stretch target for this campaign is $25,000 in reader donations. With NewsMatch, that sum becomes $50,000. With your support, we’ll hire more writers to tell the important stories of the zoning issue next door, the traffic through your neighborhood, and the Norwalk matters affecting your wallet. Will this news site grow or die? It’s up to you. Please visit our NewsMatch page and donate. Your donation will be doubled! For those of us who already donate, will our current donation (monthly) apply or do we need to make a separate donation thru the website in the article? Thanks for donating! Readers like you make Nancy’s reporting possible. The monthly amount of your current donation will be matched 1:1. If you increase your current monthly donation, NoN will receive a match equivalent to 12 times the monthly increase. For example, if you increase by $10 a month, NoN receives a bonus of $120. If you make a one-time donation, it will be matched 1:1.